These are recipes shared by our CSA members. They are delicious sugestions for ways to prepare items in your CSA. Some of them are increadibly simple, others elaborate and epicurean. They are organized by Vegetable in the index on the left. Please feel free to contribute to this list. Send your recipe to us by email. You can send it as text, or a photo of your recipe card, or a link to a recipe on line, or a scan, or... whatever. Any time you can send a photo as well, that's sensational, but don't let lack of a photo stop you. Send us your favorite recipe! Heat the oven to 325. Lightly oil a large gratin dish or a baking dish (9 by 13 inch works well). Trimming the cabbage: Peel off and discard any bruised or ragged outer leaves from the cabbage. The cabbage should weigh close to 2 pounds (if you don’t have a kitchen scale, consult the grocery store receipt). If the cabbage weighs more than 2 pounds, it won’t fit in the baking dish and won’t braise as beautifully. To remedy this, cut away a wedge of the cabbage to trim it down to size. Save the leftover wedge for salad or coleslaw. Then cut the cabbage into 8 wedges. Arrange the wedges in the baking dish, they may overlap some, but do your best to make a single layer. The Braise: Scatter in the onion and carrot. Drizzle over the oil and stock or water. Season with salt, pepper, and the pepper flakes. Cover tightly with foil, and slide into the middle of the oven to braise until the vegetables are completely tender, about 2 hours. Turn the cabbage wedges with tongs after an hour. Don’t worry if the wedges want to fall apart as you turn them: just do your best to keep them intact. If the dish is drying out at all, add a few tablespoons of water. One of Sophia's favorite Carrot salads. Eat it now or eat it tomorrow. The kale holds up well with dressing and a night in the fridge, but leave off the croutons until serving. 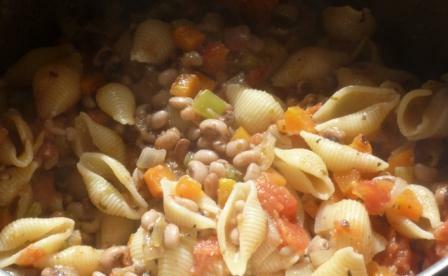 My mom made Pasta e Fagioli. It's one of my comfort foods. 1 1/2 cups Dry beans. Any type that is light in color. The night before, soak the beans in 6 cups of water in a large pot. The next day, add the ¼ cup olive oil, bay leaves, garlic cloves, 1 teaspoon salt to the pot and bring to the boil. Turn down the heat and simmer until the beans are tender (this can take from about 45 minutes up to 2 hours – it’s important to check and make sure they are cooked through.) Once they are cooked, drain the the beans and save the liquid for later use. Throw out the bay leaves and garlic. 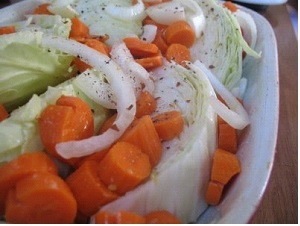 Chop the carrots, celery and onion into small pieces and in a large skillet or wok, saute them in hot olive oil. Add the crushed garlic, oregano, basil, salt and pepper, and allow to saute until the carrots are tender (about 15-20 minutes). Dice half of the tomatoes and add to the skillet. Cover and allow to cook for another 10 minutes. Meanwhile, cook the macaroni until just before al dente (about 1 minute less than recommended on the package). This is important as the macaroni continues cooking later on in the dish, and will soften further. Dice the rest of the tomatoes. Add the vegetable mix, the macaroni and the rest of the tomatoes to the bean pot. Then add about 1½ cups of the bean liquid you set aside, as well as the juice from the tomatoes. Mix gently, add extra seasoning to taste, bring to the boil, reduce the heat to low, cover and simmer for another 10-15 minutes. Note: Save the remaining bean liquid for use in heating up any leftovers. Pour into a large serving dish and garnish with parsley and Parmesan cheese if you wish. I have incluced 2 recipes for Swedish Brown Beans. The first one is very simple and is probably more authentic. The second one (with Worstershire Sause) May be more to the liking of our American pallet. It does however have more thourough basic bean cooking guidlines. 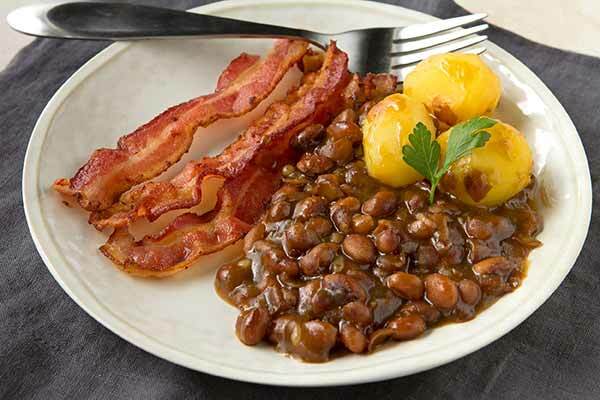 This flavorful baked bean recipe is an excellent example of the traditional Swedish dish Bruna Bönor, a sweetened bean dish typically served on Shrove Tuesday with smoked pork or Swedish potato sausage. This is the simpler of the two recipes, and seems to be more authentic. Place beans in large pot with water to cover by 2 inches. Soak at least 8 hours or overnight. Drain beans and add fresh water to cover. Cook until just tender, 1-1/2 to 2 hours. Use potato masher to smash some of beans. Add vinegar, corn syrup, brown sugar and ground ginger to beans. Bring to a simmer, and cook another 30 minutes. Season to taste with salt and black pepper. Serve hot. This flavorful baked bean recipe is an excellent example of the traditional Swedish dish Bruna Bönor, a sweetened bean dish typically served on Shrove Tuesday with smoked pork or Swedish potato sausage. Prepare Beans: Rinse and pick over beans. Pour boiling water over beans to cover by 2 inches, cover and leave for 1 hour. (check for doneness at 20 minutes). Prepare 'Beans Pot': Mix beans with onions and place in a 2 qt. casserole. Combine next 7 ingredients, heat over moderate heat and stir until cornstarch is dissolved. Mix into the bean and onion mixture and place bacon strips on top. Cover and bake in a 325 degree oven for 1 1/2 to 2 hours. 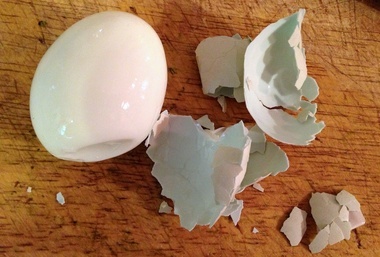 If you've ever tried to peel Farm Fresh Hard Boiled Eggs, you know "There's got to be some trick to this!" This is It. Take the Eggs out of the water and bring the water to a boil. Gently lower the eggs into the boiling water with a spoon. When the water boils again, set the timer for 15 minutes. Prepare a pot or basin of cold water with ice cubes in it. After 15 minutes of full boiling, remove the pot from the heat and drain the hot water out of the Eggs. Peel the Eggs just as easy as you please! Drizzle the butter/olive oil mixture evenly over the bread cubes and toss until they have an even coating of oil. Spread the croutons in a single layer on a baking sheet and bake at 375°F for 15-20 minutes until they are golden brown and crunchy. Set aside to let cool. Next the Dressing: Blend the anchovies, garlic, egg yolk, and lemon juice for 30 seconds until the mixture is smooth (use an immersion blender in a tall mug or wide-mouth canning jar). With the blender running, pour the olive oil in slowly for the dressing to emulsify it. Stir in the Parmesan and a couple of grinds of black pepper. Season, to taste, with salt and set aside. Refrigerate the dressing if you will not be using it right away. Assemble the Salad: Pull off the kale stems and break leaves into bite-sized pieces. Sprinkle a little salt and olive oil/salad oil over the leaves and squeeze them with your fists until the kale gets somewhat wilted and soft. Add enough dressing to coat the salad to your liking. Add the croutons and some extra Parmesan and toss the salad well. Whisk together buttermilk, mayonnaise, vinegar, shallot, sugar, 1/2 teaspoon salt, and 1/4 teaspoon pepper in a large bowl until sugar has dissolved, then whisk in chives. 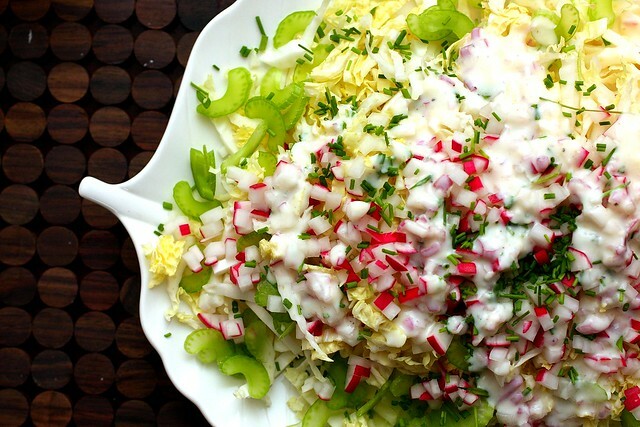 Toss cabbage, radishes, and celery with dressing. The quantities have been adjusted so that you can make the soup with 2 lbs. of parsnips. It should feed 6-8 people in this iteration (or two hungry people, who can then eat it re-heated for lunch the next few days). Add caraway and parsnips, and saute briefly. Add potatoes and water, bring to boil, then put on medium heat and cook (covered) until potatoes are soft. Add fennel, cheese, milk and black pepper. Puree until smooth. Peel parsnips and potatoes and cut into chunks. Boil in lightly salted water until very tender, about 20 minutes. Drain water (reserving some liquid for thinning the mash if needed). Sauté onions and shredded kale in 2 Tbsp butter in a large pan until soft, about 5-7 minutes. Add the milk and bring to a boil. Mash the parsnips and potatoes in a large pot. Incorporate remaining butter into the mash, then fold in kale mixture. Add reserved liquid if thinning is needed. Parsnips for desert! It's a bit reminicent of Carrot cake. Grease an 8 x 8 baking pan and line with parchment paper. Extend paper up two of the sides. In a large bowl, combine almond flour, salt, baking soda, cinnamon, nutmeg and 1/8 tsp cardamom. In a separate bowl whisk together eggs, oil, 1/4 cup maple syrup and pureed parsnip. Stir grated parsnips, ½ cup of pecans, raisins and ginger into wet ingredients. Stir wet ingredients into dry. Spread batter into prepared pan and bake at 325 degrees F for 30-35 minutes. Cool to room temperature and then turn out of pan. For the frosting, whip cream cheese and butter with hand mixer until smooth and blend in 1/4 cup maple syrup and 1/8 tsp cardamom. The grated parsnip blends in flawlessly with the arborio rice, making it a perfect dish to present to veggie-wary toddlers, and the parsnip crisps top it off with a nice crunch and flavor. Peel the parsnips, then, using the peeler, shave ½ a parsnip into thin ribbons. Put aside, and grate remaining parsnips. Trim, peel, and small dice the onion. Peel and mince the garlic. Trim and thinly slice sage leaves. Wilt the spinach in a large skillet on medium-high heat with 1 tbsp oil and dash of salt and pepper, cooking about 3 minutes. Transfer spinach to a strainer, and push excess liquid out with the back of a spoon. Transfer to a cutting board and finely chop. Set aside. Wipe out skillet used to cook spinach and place on medium-high heat. Add 1 tbsp oil and heat til shimmering. Add onion and garlic, and season with salt and pepper. Cook 3-4 minutes or until fragrant. Add rice, stirring occasionally, until lightly toasted, about 2-3 minutes. Add grated parsnip and 1 cup of stock to skillet. Bring to a boil, then reduce heat to simmer, stirring frequently, until liquid is reduced by half. Repeat twice, using 1 cup stock each time, until most of the liquid is absorbed and the rice is al dente. Add up to 1/4 cup of remaining stock if mixture is too dry. Remove from heat. While the risotto is simmering, heat a skillet on medium high, and add a thin layer of oil. Once hot, add the parsnip ribbons, and cook, turning frequently until golden-brown and crispy, about 3-5 minutes. Cook in batches if necessary to avoid crowding the pan. Transfer cooked parsnip ribbons to a paper towel-lined plate and season with salt and pepper to taste. Off heat, add spinach, sage, Parmesan, and mascarpone cheese to the risotto. Season with salt and pepper to taste. Garnish with the parsnip crisps and enjoy! Delroy, one of our Jamaican workers, came in one day singing the praises of Parsnips steamed and then fried in Coconut Oil. I love them. Slice the Parsnips into long thin strips. 1/4 to 1/2 inch wide. Put some Coconut Oil in a frying pan and heat it. Add the Pasnips strips, and a splash of water, and cover the pan. Cook on high, steaming the parnips for a couple of minute, until the Parsnips start to soften. Turn the heat down and brown the parsnips a bit in the coconut oil. Delroy is Jamaican so he uses Coconut Oil, but you could use almost any oil fat or shortening. I made this last winter and plan to make again soon, it’s a wonderful recipe for the winter veggies from Lewis Creek! I make it in small loaf pans and freeze before the final cooking step. Wanted to share! Butter 13 x 9x2-inch glass baking dish. Combine first 7 ingredients in large pot; bring to boil. Reduce heat, cover partially and simmer until vegetables are very tender, about 30 minutes. Drain well. Transfer vegetables to large bowl. Add 1/2 cup butter. Using electric mixer, beat mixture until mashed but still chunky. Season with salt and pepper. 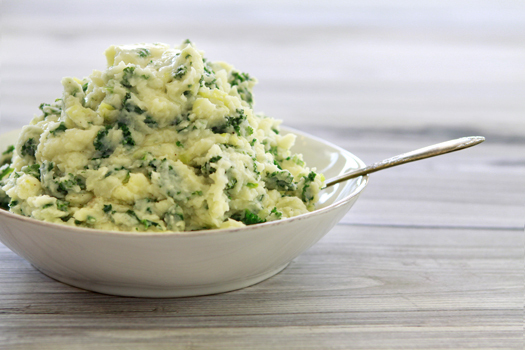 Transfer mashed vegetables to prepared dish. Melt remaining 1/4 cup butter in heavy large skillet over medium-high heat. Add sliced onions and sauté until beginning to brown, about 5 minutes. Reduce heat to medium-low and sauté until onions are tender and golden brown, about 15 minutes. Season with salt and pepper. Spread onions evenly over mashed vegetables. Preheat oven to 375° F. Bake casserole uncovered until heated through and top begins to crisp, about 25 minutes. Notes: Potato, parsnip, rutabaga ratios are flexible. I wish to tell you the story of an epic meal I made recently with the veggies from my winter CSA share . . . because you will appreciate this, and because you may want to try it yourself or share the recipe with others. I had some leftover baked butternut squash in the fridge. And I had some glorious leeks that needed to be eaten soon, but it was not a good night for the usual potato-leek soup. So I chopped the leeks fine and sauteed them in butter, and added some white wine. And when the leeks were really well cooked, I scooped the squash in and let it all warm up nicely. I put this delightful mush on top of noodles and added parmesan cheese, and it was the best thing that happened to me all week.